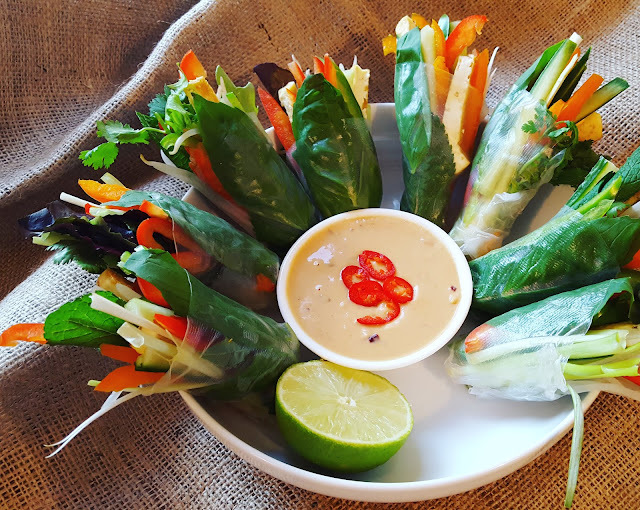 These summer rolls are crunchy, light and quick to prepare (once you get the hang of working with rice papers!). Options for fillings are endless - any crunchy vegetable combo will taste great - I've since made another batch with rice noodles in the middle, this makes the rolls much more filling. There are a couple of different rice papers you can use - bigger papers can be folded at both ends then rolled and cut in half (burrito stylee! ), the smaller ones - which I used - can be folded up at the bottom then rolled. Having tried both methods I definitely feel like the smaller sheets are easier to work with, so may be a good choice if it's your first time too! Whisk all sauce ingredients together until the mixture reaches a smooth consistency - if the mixture is too thick, add warm water to thin as required. Set sauce aside. Before preparing the rice paper rolls set a bowl of warm water next to you - you will need this to soften the sheets. Submerge a sheet in the water for about 15 seconds, you'll want to remove it before it's completely softened or it'll be impossible to lay out flat. Lay out flat on a plate and dab the top of the sheet with a clean cotton towel to remove excess water. Layer on your crunchy veggies, herbs and tofu. Fold the bottom of the sheet then roll. DONE.